Look Steak, Helvetica doesn’t have any sunglasses, he can’t possibly deal with it. awww how can helvetica stay mad at good heavens’ sad face in that last panel? your colouring and poses get better and beter. Your comment had me laughing harder and longer than I have in a long time, haha. Oh my god, haha this is brilliant. love this comic! i followed a link from fishbones and as soon as i saw it i actually sqee’d at the art. 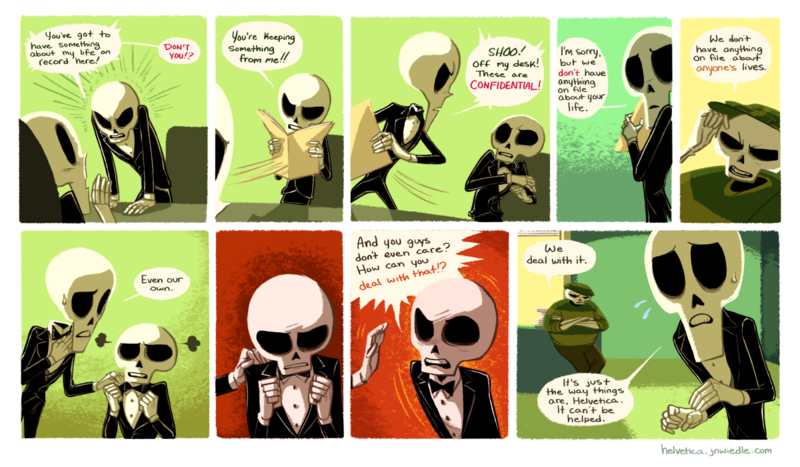 I just started reading this comic and it’s reminding me so much of Grim Fandango but with a twist – I love it so much!